Ah, that day has finally arrived. 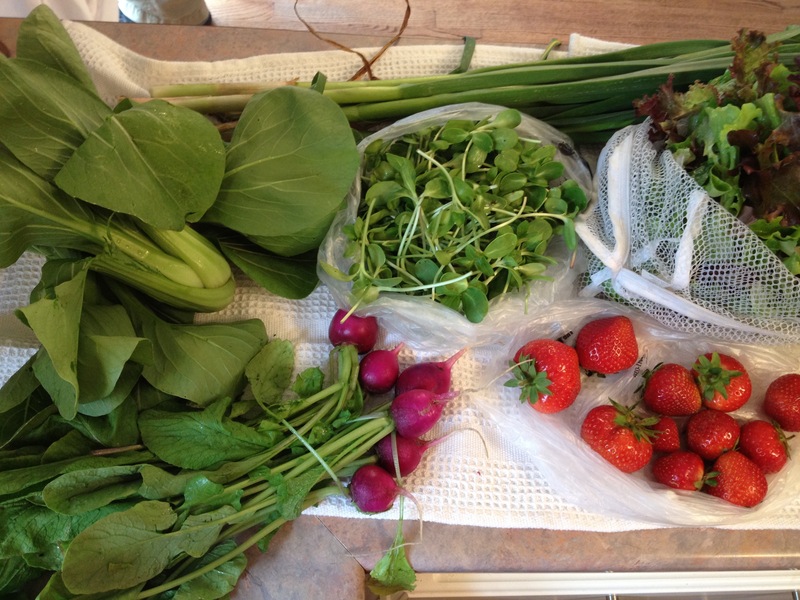 Our first Casey Farm CSA pick up was this afternoon. The farm is pretty close to Steve’s work, so he does the pick ups. I did them for like half of our share last year, so I know what he’s experiencing. Our farm does not use a box method, but rather has a share barn where every thing is laid out, labeled, and the amount allowed is clearly written above. Some things, like greens, are abundant and are “per basket,” meaning the sign might say “Arugula, 3 baskets,” and the farm provides the basket. Other things are per bunch, or mixed veggies might be “take 3lbs of what you want.” This time of year, they have tons of seedlings left over from the plant sale, so the first week or so might even include a few of those. The share barn also sells local milk, eggs, cheese, ice cream, bread, granola, and even flowers. It’s one stop local shopping, really. We get an emailed newsletter every Sunday, updating us on the farm’s goings-on, PYO (pick your own) crops and times, work share options, and most importantly, what to expect that week in the share barn! This way, I can begin to loosely plan menus for the week. Really, I never know what we’ve got until Steve walks through the door. And not seen here, four seedlings each of purple cherokee heirloom tomatoes and cherry tomatoes. Looks like I’ll need more pots! This is one of the one billion reasons why I love my husband: he knows what I hate to eat and/or cook, and he won’t bring it home (here’s looking at you, kohlrabi!). 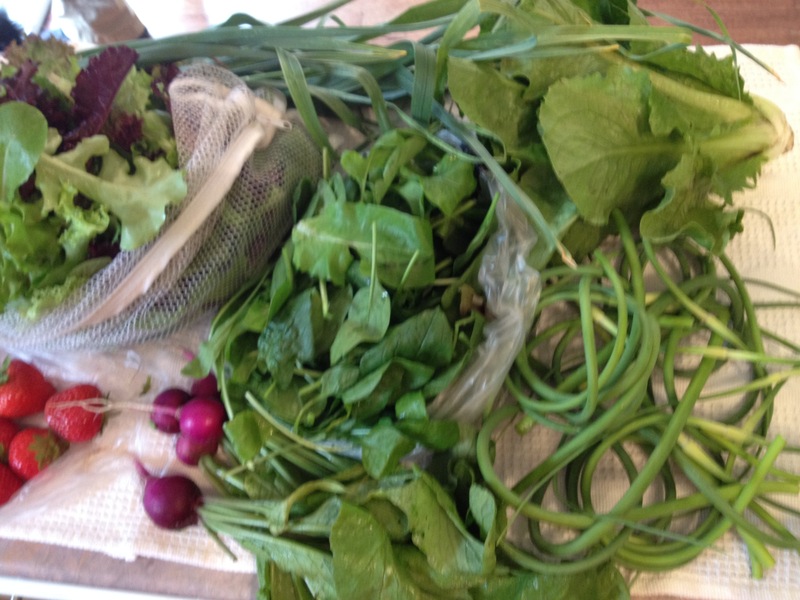 And on the flip side, he tries to bring home what I love to cook and/or eat (radishes!). Looking forward to eating all of this up! I’ve got to use up some Trader Joe’s bagged spinach first, but I foresee many a salad in our future. Which is good; I gotta lay off pretty much everything else! 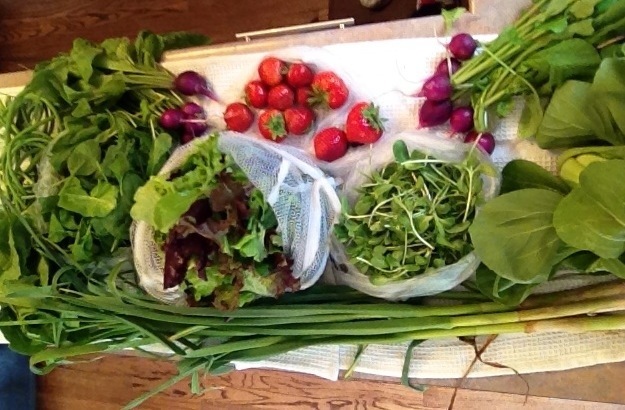 beautiful bounty 🙂 Come and link up to this week’s CSA link party…http://inherchucks.com/2012/06/06/whats-in-the-box-29/. Looking forward to seeing you there! I feel your pain on kohlrabi. We’ve had it two weeks in a row and so far I’m 0-2 on kohlrabi preparations. I think we may never be friends. When I get overrun with greens, I use them in smoothies. It works well.